Ghee is a form of clarified butter and is one of the healthiest cooking oils you can use. 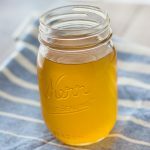 Learn how to make ghee with my simple tutorial! If If If you’ve followed my blog for long, then you know that it’s usually listed in my recipe ingredients. So, what is ghee (gē) and why would I want to use it in my cooking? Besides the fact that it is just utterly delicious, there are a number of reasons. I’ll not only tell you why I use it but also how to make ghee. Although, it’s just begun popping up in conventional grocery stores in the last few years, Ghee has been used in India for thousands of years. It is a form of clarified butter in which the water and milk solids have been removed. 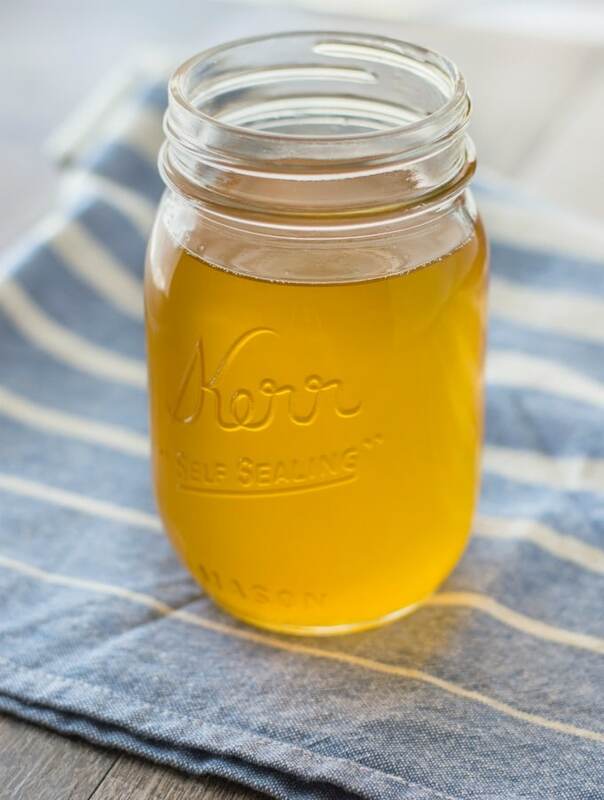 Ghee is more golden in color than clarified butter and has a light nutty flavor. It has a high smoke point of 450°F, which makes it great for sautéing and baking. And if you like the flavor that butter adds to dishes, then you are going to love your eggs fried in ghee and veggies that have been roasted in it! During the clarifying process, the lactose and casein are removed from the butter. Because of that, sometimes people who have problems with dairy can tolerate ghee. That is not always the case though, so if you are someone with severe intolerance, you might want to check with your doctor or avoid it. Ghee made from grass-fed cows is rich in CLA (conjugated linoleic acid), which has been shown in studies to be helpful in fighting cancer. It contains Vitamin K2, which is essential in helping the body utilize minerals including calcium. Human research has also shown it to be useful in helping to lower body fat and aid in weight loss. 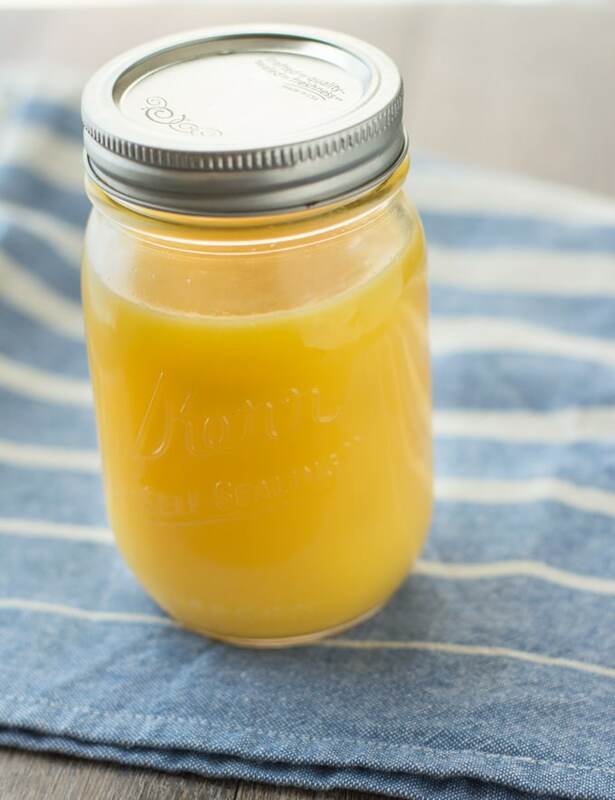 Ghee is also a good source of Vitamin D.
If you’ve seen jars of ghee at the store, then you may have been as shocked as I was at the price tag. A jar of a well known brand that’s about the same size as mine goes for around 12 dollars at our local Kroger. Twelve dollars! Which is exactly why I learned how to make ghee at home. See that jar up there? That only cost me around six bucks to make. That’s quite the savings! Plus, it’s so simple to make. I use the Kerrygold brand of unsalted butter to make mine. Trader Joe’s has the best price on Kerrygold of all the stores in our area. Other stores do occasionally have it on sale for around the same price or less, but that’s rare to find. While I don’t have much experience substituting ghee for butter in baking recipes, from what I understand you can. It may require less ghee than the butter called for. One recipe I saw called for a tablespoon less of ghee. In the case of vegetable oils, it can be substituted at a 1:1 ratio for baking and sautéing. It works great in place of Crisco or canola oil for my Skillet Cornbread. I know that some people store this in an air-tight container on the counter for a few weeks, but I always refrigerate mine. Just feel better about it that way. Ghee becomes solid when refrigerated, which is why it looks a little different in the second picture above. Left on the counter it can be semi-solidified. This time, I made a big batch of it, so that I wouldn’t have to make it again so soon. If you prefer, you can just use 8 oz. of butter (1 brick of Kerrygold) to practice making it first. Same instructions either way. Oh, and be sure to get the unsalted (silver package if using Kerrygold) kind of butter to use. In a medium heavy-bottomed saucepan, heat the butter over medium heat. The milk solids will float to the top as the butter separates. Once the butter has completely melted, lower the temperature to low and continue cooking until most of the bubbling noises have stopped and the milk solids have sunk to the bottom of the pan and turned brown. Ghee is a form of clarified butter and is one of the healthiest cooking oils you can use. It's great to use for high-heat cooking. In a medium heavy-bottomed saucepan, heat the butter over medium heat. The milk solids will float to the top as the butter separates. Once the butter has completely melted, lower the temperature to low and continue cooking until most of the bubbling noises have stopped and the milk solids have sunk to the bottom of the pan and turned brown. Do NOT stir while this cooks Some of the butter might splatter out of the pan so stand back. This could take between 30 and 40 minutes from the time you start. As you start to hear less bubbling noises, watch the pot carefully in the last few minutes so that the milk solids do not burn. Remove from burner immediately. Pour the ghee through a mesh strainer that's been lined with a double layer of cheesecloth into a heat-proof and air-tight jar. Let cool before placing the lid on, then refrigerate for up to six months. Using a stainless steel pot will help you keep an eye on the color. Canning jars are great for storing since they are air-tight. Posts contains an affiliate link. If you purchase a product through an affiliate link, your costs will remain the same, but I earn a small commission. This helps to cover the costs of this site. Thanks for your support! By Tempie at March 9, 2018 .